Eight Center for Justice and Peacebuilding graduate students collaborated to plan and lead an arts-based peacebuilding workshop for local refugee and immigrant students last weekend. More than 30 students from Harrisonburg High School’s Peer Leaders club participated. The club, which offers support, activities and fellowship to students transitioning into a new culture, is a collaborative effort between EMU, James Madison University and Church World Service. Drumming, drama, writing and art activities helped students learn more about and express themselves, preparing them to be change agents in their school and community context, said Kajungu Mturi, a 2018 CJP alumnus who had helped to facilitate the afterschool club since it began three years ago. Funding for the workshop was provided by a CJP Creative Initiatives grant. Students Eunkyung Ahn, Felix Kioko and Renata Loberg developed the initial proposal. 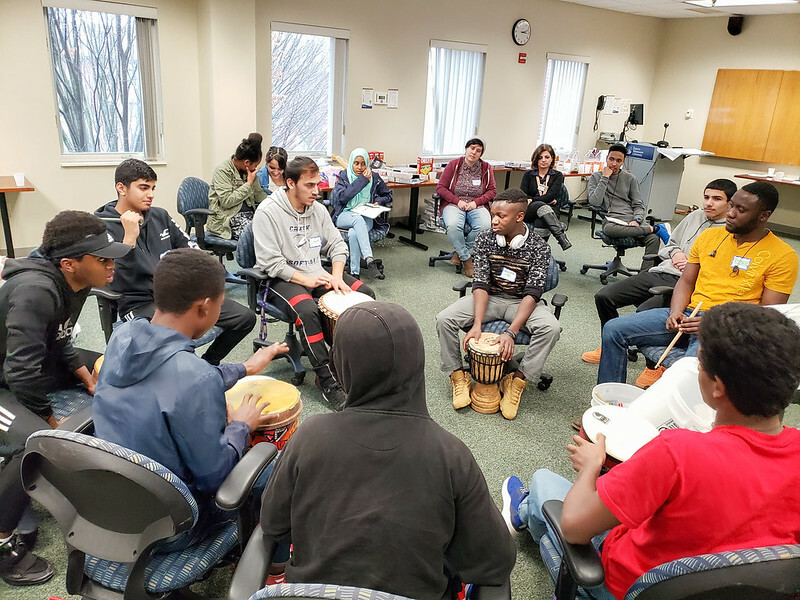 Arts facilitators included Yasmiene Mabrouk, Rodrigue Makelele and Emily Higgins, who led zine-making, drumming, and poetry workshop breakout sessions. Kirby Broadnax, Amanda Chandler and Eugene Kraybill offered logistical and photography support. Actors from Inside Out Playback Theater contributed to a morning community-building session and an afternoon break-out session.